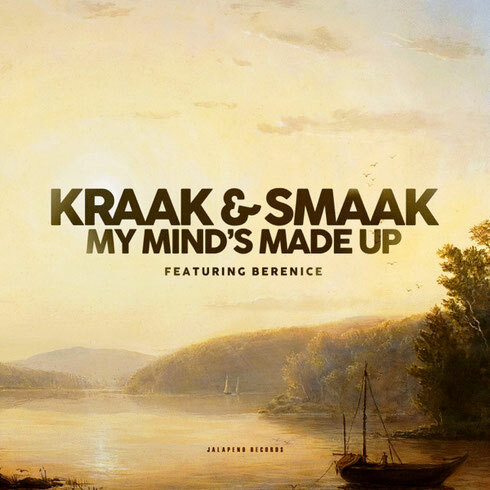 Following a string of releases on Spinnin’ and Axtone as well as a single on their own Boogie Angst label, Kraak & Smaak make a return to Jalapeno with ‘My Mind’s Made Up’, a big disco boogie tune. Channelling classic upbeat soul with analogue production, this track could be straight off an ’80s dancefloor with a kvocal delivered by Berenice, the soul singer who fronts K&S live shows. On the B-side ‘Shiiiit’ is anything… but fusing house, funk, disco and a cheeky sample together with classic K&S flair. Kraak & Smaak are currently working on their fifth studio album due for delivery in 2016. Autumn 2015 found them playing a series of live shows including a sell-out Melkweg performance as part of Amsterdam Dance Event. The band’s live show has seen them play live and DJ all over the world from Glastonbury to Coachella and many places in between. Their eclectic tastes have seen them work with vocalists including Romanthony, Ben Westbeech, Lee Fields and Joi Cardwell. Their new album sees them song writing with Ivar and Berenice who form the vocal partnership at the front of their live show as well as a number of special guests.